Thereafter, there can be the possible administration and liquidation (sale) of the debtor's assets by the trustee and distribution of dividends to creditors. 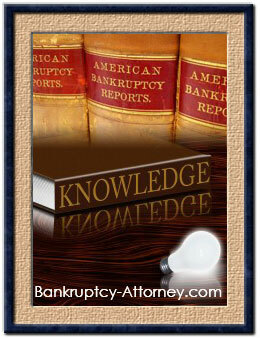 On the filing of the Chapter 7 case, all of the debtor's property becomes property of the bankruptcy estate, subject to administration by the trustee. Keeping Certain Property by Claiming it as "Exempt"
An individual debtor is entitled to keep certain property by claiming it as "exempt". The nature and extent of the exemptions are generally set by state, rather than federal, law. Generally speaking, if a creditor is the holder of a claim which is secured by property of the estate (such as the lien-holder on a car) that creditor's lien, with certain exceptions, will remain valid. In most cases the result is that there is no property over and above the debtor's exemptions and the secured creditors' claims to justify the trustee's administration of assets. These cases are known as "no asset" cases, with the result being that there are no assets sold and no payments made to creditors. The no-asset case is the most common Chapter 7. In close cases, where there might be some minor or nominal value, if the only result of administration would be to benefit the trustee and other professionals by payment of fees, then the trustee is duty-bound to abandon the assets back to the debtor. Asset administration under such a scenario is denominated "churning". It does not further the goal of equitable distribution under the Code, andthe Courts have consistently treated it as unacceptable conduct. In Chapter 7, the debtor attends a meeting of creditors, conducted by the trustee within 21-40 days after the petition filing. The trustee examines the debtor under oath, and is required to make sure that the debtor is aware of the consequences of the bankruptcy filing, including impact on credit, alternate bankruptcy chapters, the effect of a discharge, and the effect of reaffirming certain debts. Once the meeting is concluded, the debtor's claimed exemptions become final unless an objection is filed within 30 days thereafter. Usually by the time of the meeting, the trustee will have come to a decision as to whether it is a "no-asset" or "asset" case. The debtor is required to cooperate with the trustee and provide copies of requested financial documents and records. In true "asset" cases, the trustee then administers the nonexempt assets and makes payments to creditors who filed proofs of claim per the distribution scheme set forth in Section 726 of the Code. Claims are required to be filed with the court within 90 days after the date first set for the meeting of creditors, with governmental units given 180 days to file. Debts are paid in order of priority, with generally domestic support debts coming first, then administrative expenses, then certain other priority claims like wages and consumer deposits, and then payments on general unsecured nonpriority claims. Occasionally there will be cases where the case was originally thought to be a "no asset" case, but where the trustee later decides there may be assets available for distribution. The trustee then causes to be sent out a Notice of Possible Dividend, giving the creditors additional time to file claims. Sometimes these assets come from the trustee's recovery of money and/or property from third parties via use of the trustee's avoiding powers, including suits for recovery of preferential transfers and fraudulent conveyances.